LOUDON, NH., February 2, 2018 —Plan Tech, Inc. selected to produce thousands of urethane springs for a die cutting application. Urethane die springs are a critical piece for the operation of die cutting where corrosion, vibration, or magnetism prevents the use of conventional steel springs. Urethane die springs are used to replace conventional steel springs which can fracture in operation and cause possible injury to machine operators. Advantages of urethane die springs include non-marring springs that are quiet and handle higher pressures than conventional steel springs. Urethane die springs also have a high load-carrying capability, high dielectric strength and non-magnetic while offering vibration damping \ shock protection. Each spring needs to perform the exact same throughout its service life, urethane is an ideal choice of material for high abuse applications in any environment. 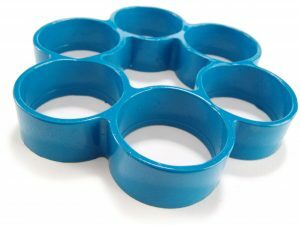 Each urethane die spring will be molded using high-performance materials at Plan Tech. Our customer looked at many different types before deciding urethane was the best choice for this application for many reasons. Urethane is easily molded into almost any shape, food safe and will outperform similar materials 3:1. Urethane also has a longer service life. Originally our customer tried another material with catastrophic results. The material was of poor quality and fell apart quickly. Plan Tech uses only high-quality material from world leaders in urethane material. Our urethane will compress and rapidly return to their original shapes for years to come. For these urethane springs, we decided it would be as a molded piece to lower the cost of the finished product. Making molds yield parts to almost print with very little secondary process saving our customer money and lowering the lead time on repeat sales.